Summary: From the New York Times bestselling author of Midwives and The Sandcastle Girls comes a spellbinding novel of love, despair, and revenge—set in war-ravaged Tuscany. 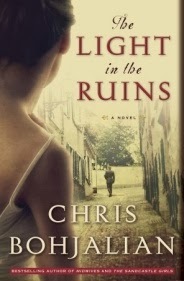 One of the highlights of my beach reading list was THE LIGHT IN THE RUINS by Chris Bohjalian. I am a huge fan of Mr. Bohjalian's and I seem to enjoy all of his books a great deal. That was certainly the case with THE LIGHT IN THE RUINS. Like some of his recent works, this novel was historical fiction, but it was also a terrific literary thriller. It goes without saying that I had big expectations for this novel -- Mr. Bohjalian and a mix of two of my favorite genres! THE LIGHT IN THE RUINS takes place in Florence, Italy, in 1943 and 1955. The Rosati family comes from a long line of nobles and lives on an estate with a beautiful villa. They believe that they will be safe from the war; however, soldiers arrive and request access to an ancient Etrusan burial site. The Rosatis, and especially the 18 year old daughter Cristina, face some drastic events. Fast forward ten years after the war has ended... the Rosati family is facing a different sort of crisis. Someone is brutally murdering members of the family, one-by-one; and investigator Serafina Bettini is working the case. Serafina is dealing with scars from the war, both mental and physical ones; and her investigation into the murders causes her to uncover things not only about the Rosatis but also her own past. What can I really say about THE LIGHT IN THE RUINS that hasn't already been said? It has received numerous positive reviews including starred ones from Library Journal and Booklist, and bloggers everywhere have been raving about this book for months. Of course, I agree with all of them. THE LIGHT IN THE RUINS was not only a well written and well researched piece of historical fiction, but it was also an intriguing literary thriller. Kind of the best of both worlds! The stories in THE LIGHT IN THE RUINS go back and forth between Tuscany during World War II and Florence in 1955. Often times when a novel spans two different time periods, I find that I prefer one to the other. In the case of this book, I actually enjoyed both. The World War II parts were interesting from a historical perspective to me -- I pretty much knew nothing about the Nazi occupation of Italy, but I thought the character development, namely Serafina, and the mystery were better in the later sections. Mr. Bohjalian obviously did a great job of merging the two stories for optimal value! There were many very good things about this novel that I'm hard pressed to just select a few to feature in this review. However, the one thing that keeps coming to my mind is the character of Serafina. I loved how complex she was. It unusual for her to be an investigator with a police department in 1955, and I appreciated seeing the challenges she faced as a result of being a woman as well as her process for solving crimes. But it was her inner struggles that really captured my interest. Serafina is damaged from the war in both visible and hidden ways, and I liked how investigating the Rosati murders brought to surface all of her pain. As she worked through finding the murderer, she was also forced to face some demons from her past. I found it all extremely interesting and loved how the author tied everything together. This might come as a surprise (not!) but I think THE LIGHT IN THE RUINS would make a wonderful book club selection. I've read a few of Mr. Bohjalian's books for my book clubs through the years, and they always provide a lot of material for discussion. I was excited to find a discussion guide for this novel with thirteen stimulating questions. Some of the themes you might want to discuss include love, family, war, sacrifices, ethical dilemmas, survival, scars, and loss. THE LIGHT IN THE RUINS is sure to be appreciated by fans of historical fiction and literary thrillers. Highly recommended. Glad to read that you highly recommend this. I won it from the publisher and will be reading it soon. I've read two books by this author. I liked one, hated the other. So we'll see. The only book of his I've read is The Night Strangers, but WOW was that one good! If that is any sample of his other work, I need to get busy. I guess I've read many (maybe too many) books that go back and forth, and involve WWII. But I trust this author. I'm going to have to seriously consider it. I've only read one of his books - Skeletons at the Feast - but I loved it and really want to read more of his work. This sounds fantastic!! I have this in audio -- hope to listen this month. I love his work. This one is on my wish list! Glad to see you liked it. I still have to read Skeletons at the Feast. I haven't read this one yet, but I plan to. Glad to hear it is a good one!